Based on reviews from 8 experts and 571 users. Learn how our rankings work or see our guide to CR7 Collection football boots. Updated Apr 2019. Being the face of the most advanced and tech-heavy Nike football boot silo- the Mercurial, it is not a surprise that the American brand launched not just one but seven collections of signature football boots for Cristiano Ronaldo. Each series of the CR7 football boots chronicles the most important milestones and achievements of the Portuguese superstar’s personal life and professional career. Who is Cristiano Ronaldo anyway? Born Cristiano Ronaldo dos Santos Aveiro, Cristiano Ronaldo is a football player from Portugal who has taken the soccer world by storm since the time he signed for Manchester United in 2003 at a young age of 16. Regarded as one of the most successful footballers of all time, Cristiano Ronaldo managed to get three Ballon d’Or awards and at least 500 goals in his career. Before he arrived at where he is now, he also had his share of ups and downs. Some of the most important milestones in his life are taken into account in each of the seven CR7 football boot chapters. He has been wearing Nike Mercurial Vapor football boots since he debuted in Lisbon with Sporting until 2002. Dubbed as Chapter 1: Savage Beauty, these CR7 football boots are inspired by Ronaldo’s volcanic birthplace, Madeira. Featuring the most intricate design in Nike football boot history, the iconic six-color, lava-inspired print is a reflection of Ronaldo’s explosive skills, incredible speed, and fiery passion for the sport. An iridescent Swoosh complements the overall look of these CR7 football boots. The first installment of the special edition CR7 football boots wears the official color combination of Black-Total Crimson-Vivid Purple/White. To highlight them as signature boots, a classic CR7 logo is seen on the lateral side. These lava-laden CR7 football boots were released in October 2015. The focal point of the Chapter 2: Natural Diamond series is Ronaldo’s strength and perseverance as well as his transition from a young athlete to becoming a global superstar. At a tender age of 12, he left home to go to Lisbon to chase that dream of becoming a professional football player. Just as a natural diamond requires extreme pressure to shine, Ronaldo had to go through the most challenging time of his life and undergo extensive training to polish his skills. The Ocean Blue upper represents the sea that Ronaldo crossed when he traveled from Madeira to mainland Portugal. A first for Nike, these CR7 football boots feature a textured heel that gradually smoothes out to the forefoot. This symbolizes Ronaldo’s rough years that crafted him to be the brilliant footballer that he is today. To complete the sparkle, Nike added a large Swoosh in the forefoot and the CR7 branding on the heel. These brilliant CR7 football boots were released in March 2016. Chapter 3: Discovery highlights how Ronaldo’s success story began. On August 6, 2003, during the inauguration of the Estádio José Alvalade stadium, Sporting CP played a friendly game against Manchester United. Ronaldo scored 2 goals that led Sporting CP to a 3-1 win against the Red Devils. The Manchester United players were so impressed by the young Ronaldo’s tremendous speed, potential, and techniques that they urged their coach, Sir Alex Ferguson, to sign him to the team. Less than a week after the match, Ronaldo has crossed over to the red side with a mind-blowing £12.24 million contract, which made him the most expensive teenage player in English football history. This also made him the first Portuguese to join the club. The “Seaweed” and “Volt” combination and contrasting knit pattern of these CR7 football boots pay homage to the Sporting CP’s home kit colors. The subtle wave dot design on the lateral side of the shoe links back to the Mercurials Ronaldo wore in 2003. Etched on the heel of these CR7 football boots are the number 06, 08, and 03 to commemorate the fateful day the superstar was discovered by Sir Ferguson. Also found on the heel is the outline of the stadium where Ronaldo was discovered. A glittery CR7 branding caps off the signature look of this series. These symbolic CR7 football boots were released in November 2016. As a celebration of the moment when CR became CR7, the Chapter 4: Forged for Greatness CR7 football boots were born. These boots commemorate Ronaldo’s rise to the top during his time with Manchester from 2003 to 2009. Story has it that Ronaldo was surprised to know that Sir Ferguson wanted him to wear a number 7 instead of his usual number 28, knowing full well the iconic players who have worn the shirt number. Ronaldo quickly shut down doubts when he won for the team three Premier Leagues, two English Super Cup, a UEFA Champions League, an FA Cup, an English League Cup, and a FIFA World Cup. It was during this time when CR7’s physical abilities and technical skills were forged for greatness. Dressed in a molten-esque orange and red soleplate that gradually transitions to metallic tone in the upper, these CR7 football boots reflect the way Ronaldo’s career and skills were forged as he mastered the art of football. On the medial side of the football boot is a tonal CR lettering beside a prominent 7 to highlight the superstar’s iconic number. Recalling Ronaldo’s shift from Sporting CP’s #28 to Manchester United’s #7, the heel counter features XXVIII, the Roman Number for 28, with a highlighted VII. These iconic CR7 football boots were released in April 2017. As the Chapter 2: Natural Diamond depicts Ronaldo as a raw diamond, the Chapter 5: Cut to Brilliance CR7 football boots presents him as a polished gem. This collection hails Ronaldo’s biggest achievements in the sport as well as his move from Manchester United to Real Madrid. His £80 million transfer to Real Madrid also served as the inspiration behind the design of this collection. The predominantly white CR7 football boot is inspired by the superstar’s new club, Los Blancos. Its blue tint, multi-colored Flyknit yarns, and the iridescent coating on the upper are a creative representation of light shining through a diamond. Visible on the instep is the iconic CR7 logo. His presentation date at the Bernabeu stadium as well as the writings “El Sueño Del Nino” (The Dream of A Child) are seen on the heel. These diamond-inspired CR7 football boots were released in September 2017. Cristiano Ronaldo paid tribute to his home country in the Chapter 6: Born Leader CR7 football boots. The penultimate chapter centers on Ronaldo’s role as the team captain of Portugal. During his time with the Portuguese Federation, he broke the record of having the most scored goals and encounters as well as winning the 2016 European Championship. These accomplishments made him the best player from Portugal. The color palette of these CR7 football boots complements the country’s traditional hues. The overall design motif also links back to the vibrant sea exploration tradition of Portugal. A ‘C’ sits atop an armillary sphere which is a nod to Ronaldo’s leadership. These nautical-themed CR7 football boots were released in March 2018. The Chapter 7: Built On Dreams CR7 football boots are launched in time for Champions League debut. Sporting a bright red upper with a silver gradient, these eye-catching football boots have the number 7 graphics in the forefoot, heel, and sole as a tribute to Ronaldo’s shirt number. The colorway is reminiscent of the Mercurial Superfly VI launch color, Total Orange. The printed carbon fiber graphic on the heel also pays homage to the superstar’s favorite Mercurial SL Carbon Fiber. A silver Mercurial branding and 000015 are found printed diagonally. 000015 signifies that this is the 15th exclusive colorway that Nike has released for Cristiano Ronaldo. Even CR7’s signature is seen on the heel of this football boot. These CR7 football boots were released in September 2018. Aside from the seven chapters that are previously mentioned, several other CR7 football boots have also been released but in limited quantities. Like the seven chapters, they commemorate some of Ronaldo’s accomplishments as well. Marking Cristiano Ronaldo’s fifth Ballon D’Or is the release of the Nike Mercurial Superfly Quinto Triunfo. The American brand has released only 1,000 pairs of this gold CR7 football boot. It is named Quinto Triunfo which is Spanish for fifth triumph. Each pair is numbered for a sense of exclusivity and uniqueness. The years of his awards - 2008, 2013, 2014, 2016 and 2017 - are featured on the inside of this limited edition football boot. It comes with a special box and a gymsack featuring the victorious years of the Portuguese superstar. On Ronaldo’s second tour with Nike in China, an exclusive C罗collection was released. The football boots, replete in Chinese-inspired embellishments and a new logo, are exclusively available in Asia. The new logo includes an ancient boat compass, the CR7 mark in Chinese, and the captain’s “C”. With the CR7 logo in Chinese characters, these stunning football boots are set to breathe fire into Chinese football on and off the pitch. The special edition Mercurial Superfly Elite CR7 is decorated with graphics that symbolize the fire dragon. It is dressed in a stunning red upper with gold trim and a black Swoosh running from the forefoot to the lateral side of the shoe. Its split soleplate also comes in metallic gold. Moreover, CR7 logos in gold are found on the sockliner and tongue. The Nike React FC CR7 is a Trainer football boot that comes with Nike’s ingenious React technology. It is designed by Cristiano Ronaldo himself. The gold dragon detail that circles around the bottom part of the upper as well as the toe box is a stark contrast against the black upper. A translucent outsole with more gold underlays completes the look of this luxurious CR7 football boot. Gold CR7 brandings are found on the knitted tongue, on the insole, and on the heel part of the outsole. Nike and Cristiano Ronaldo worked with graphic designer Jessica Tresser in designing each of the seven collections of the series. A Safari-infused CR7 football boot, the Nike Mercurial Vapor Superfly II Safari CR7, was released in 2010. A summer-themed CR7 football boot is available in the form of the Nike Mercurial Vapor IX ACC CR7. Its upper has a white bottom with a lime green, dark blue, and orange stripes the convey a fresh vibe. Aside from the Nike CR7 football boots, what are some of the football boots that Cristiano Ronaldo has worn? Cristiano Ronaldo has worn several other Nike football boots throughout his career. Some of them include the Mercurial Vapor R9, Mercurial Vapor III, Mercurial Superfly II, and Mercurial Vapor VIII. Other than the seven chapters of CR7 football boots, are there different colorways of CR7 football boots? There are several other colorways for the CR7 football boots. 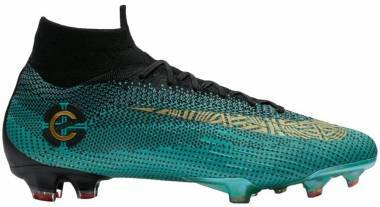 There are black CR7 football boots namely the Carbon Fiber CR7 football boot released in 2018 and the Mercurial Superfly CR7 AG. There are also gold CR7 football boots which include the Nike Mercurial Superfly V CR7 FG and Nike Mercurial Superfly CR7 Vitórias. What are the available variations of the CR7 football boots? CR7 football boots are available in firm ground (FG), soft ground (SG), turf (TF), and indoor (IN) variations. Good examples are the Nike Mercurial Vapor XI CR7 Firm Ground, Nike Mercurial Victory Vi CR7 DF SG, Nike MercurialX Vapor XII Academy CR7 Turf, and Nike MercurialX Finale II Indoor, respectively. A multi-ground CR7 football boot is also available in the form the Nike Mercurial Vapor XII Academy CR7 Multi-ground. Are there available CR7 football boots Junior version? There are several CR7 football boots boys would like. They include the Nike Mercurial Vortex CR7 FG Junior and Nike Mercurial Victory CR7 FG Junior.